A big, bold Hollywood movie that won't be winning any awards for subtlety but can't be denied its popcorn appeal. 116 min. Touchstone Pictures. Director: Tony Scott. Cast: Denzel Washington, Gene Hackman, Matt Craven, George Dzundza, Viggo Mortensen. Just for good measure, Tony Scott's thriller Crimson Tide--a sort of last gasp at exploiting the Russian threat before the Cold War receded into period pictures--takes place during October. Get it? It's a Red October! And even though the majority of the film takes place on a nuclear submarine, Scott manages to work in venetian blinds and atmospheric, pelting rain. You've got to admire his persistence: well maybe you don't, but fellow style-hounds Jerry Bruckheimer and Don Simpson certainly did, since Scott pretty much set the producers' style guide. Still a doubter? Take note of the film rare pop-cultural distinction: a full-blown parody on The Simpsons. Crimson Tide is a big, bold Hollywood movie that won't be winning any awards for subtlety but can't be denied its popcorn appeal. In Denzel Washington and Gene Hackman, it has two crack stars working at full throttle. Essentially, it's an adrenalized Mutiny on the Bounty, with Hackman's commander squaring off against Washington's executive officer in a nail-biting worst-case scenario. During "the worst standoff since the Cuban Missile Crisis (involving Daniel von Bargen's Russian rebel leader--whoops: try not to think about Kruger from Seinfeld), radio orders indicate that the U.S.S. Alabama should launch its missiles. On its heels, a follow-up message arrives, but the radio goes on the fritz, leaving the message's intent obscure. DEFCON Three! Screenwriter Michael Schiffer effectively establishes the wariness with which Washington's reasoned, independent-minded, supposedly "simple" Lt. Commander Hunter and Hackman's bluff, alpha-male, "complicated" Capt. Ramsay regard each other. When he pits them openly against each other, alliances are made and broken on both sides of the debate over what action is most advisable: Ramsay's by-the-book salvo or Hunter's cautious verification. Though the conflict is framed relatively simply, Schiffer can be credited for raising the eternal question of whether second-guessing orders is the worst or best thing for an intelligent soldier to do in a crisis situation. In the spirit of the old-school sub pictures it specifically references (The Enemy Below, Run Silent, Run Deep), Crimson Tide benefits enormously from a deep-bench supporting cast: Viggo Mortensen, James Gandolfini, George Dzundza, Rocky Carroll, and Matt Craven are the swing votes, but the enlisted men include Steve Zahn, Rick Schroder, Ryan Philippe, Danny Nucci, and Lillo Brancato Jr. (Jason Robards also turns up before the credits roll). A guy's movie par excellence, Crimson Tide at first runs on military jargon and a high-testosterone tension between camaraderie and the clipped ceremony of the chain of command. When the war of wills breaks out, things get properly sweaty, abetted by Quentin Tarantino's uncredited script polishes. Washington exhorts his "Scotty" to save the ship by repairing the "warp drive" (read radio), and there's a film-stopping argument over whether the Kirby or Moebius Silver Surfer rules. "This is as real as it gets," Ramsay declares, but we willingly suspend our disbelief to immerse ourselves in Scott's thunderous style (with Hans Zimmer score to match). Scott employs a dynamic sense of movement and bustle within the tight confines of his submarine sets (is that a dutch-angled tracking shot or am I seeing things?). With impeccable work from two Oscar-winning leading men, Crimson Tide is pure old-Hollywood fun, only made tastier by the meat on the bone. 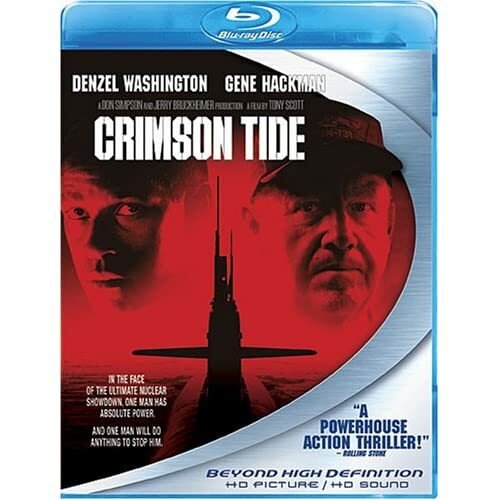 Returning to home video in a freshly minted, affordably priced 1080p hi-def Blu-Ray edition of the film's original theatrical cut, Crimson Tide seems even sharper than it did in the movie theater. A bit of dirt is evident early on (and quickly banished from the mind), but fine detail and color are expertly rendered; the PCM surround soundtrack likewise brings the theatrical experience home with a powerful and expertly balanced dynamic. It's a pleasant surprise indeed to see a thirteen-year-old film appear this youthful on home video. Though the packaging incorrectly states that the bonus features are in high-definition, they're presented in standard 480i/p. Never mind: they're an enjoyable suite of supplements that prove genuinely enlightening about the production. First are seven quick "Deleted Scenes" (6:14, with a "Play All" option): "Movie Trivia on Bus," "Sara Interviews Radchenko," "Radchenko Debriefing," "Ramsay Asks Hunter to Talk to Cob," "Hunter and Cob Chat," "Cob's Joke," and "Awaiting the Naval Hearing." "All Access: On the Set of Crimson Tide" (10:18) is a great behind-the-scenes feature that's over all too soon. Unlike the usual EPK, this short featurette lives up to its name with candid shots that find the cast and crew in a jovial mood; we see the crew setting up shots, the cast rehearsing scenes on set, and plenty of uncensored joking. "The Making of Crimson Tide" (19:57) is more standard-issue, but still provides valuable insight into how the film was made, including cast and crew perspectives, comments on the Navy's lack of participation, and a look at the visual effects. Crimson Tide is a film with plenty of replay value, the sort that's a no-brainer to add to a self-respective movie lover's shelf. All site content © 2000-2019 Peter Canavese. Page generated at 04/17/2019 08:29:27PM.